Looking for a great breakfast or brunch spot in the Mt. Pleasant / Main Street area on the East Side of Vancouver? 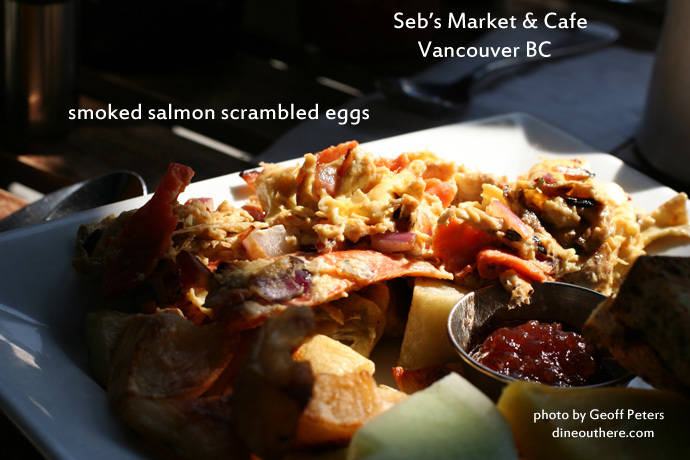 Check out Seb’s Market Cafe (map, website, 592 East Broadway, Vancouver, British Columbia, Canada, phone: 604-298-4403). Owner operator Francois Godbout found success in the Vancouver film industry catering business before deciding to open a home-style, family-friendly breakfast and brunch place in a neighborhood that is growing and becoming more “happening” by the day. A friend of mine is a regular customer here, and he recommended that we try it one Saturday morning. The food was fantastic – I had the Smoked Salmon Scrambled Eggs (pictured below, $9.00) which were made with smoked salmon (of course! ), red onions, and cheese, and served with homecut potatoes, toast, and homemade preserves. I also enjoyed the freshly squeezed orange juice (also pictured below) which was the real thing (and had no sugar added so it was a little bit tart, but very refreshing nevertheless). My friend is a bit worried that if more people discover this secret amazing brunch place, it may get too busy! But that would be a sign of success for Seb’s and in the event they needed to expand, I’m sure they could handle it quite well. Smoked salmon scrambled eggs ($9.00) from Seb's Market Cafe in Mt. Pleasant area of Vancouver BC Canada. 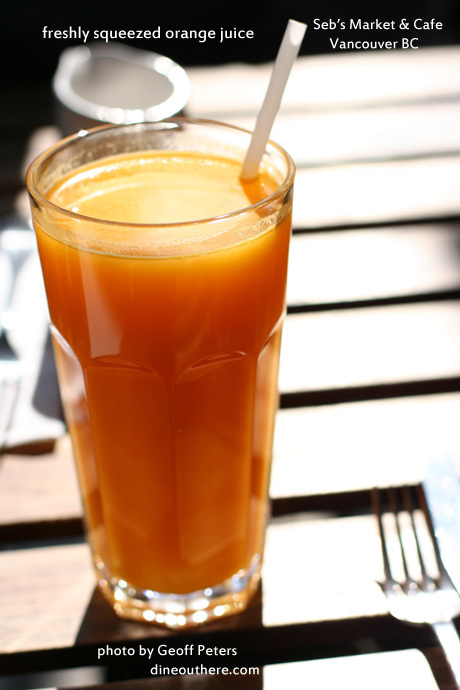 Freshly squeezed orange juice from Seb's, a great breakfast and brunch place in East Vancouver. Calhouns Bakery and Cafe (web site, map, 3035 West Broadway, Vancouver, BC, Canada, phone 604-731-7062) is a large barn-like restaurant in the Kitsilano neighborhood that is open 24 hours and serves a variety of pre-prepared entrees such as the Perogies (around $7.00, pictured below), desserts, coffee, and alcoholic beverages. At Calhoun’s, pick out an entree from the deli-style refrigerated display case, and then pay first before eating. If they’re not too busy they’ll bring the food out to your table once they heat it up, or else they’ll put it on the counter beside the espresso machine. Calhouns also offers a catering service (more details) to the Vancouver area. My office uses them sometimes for catering lunch meetings. Calhouns has a bakery on site, and their sourdough bread is incredibly fresh. 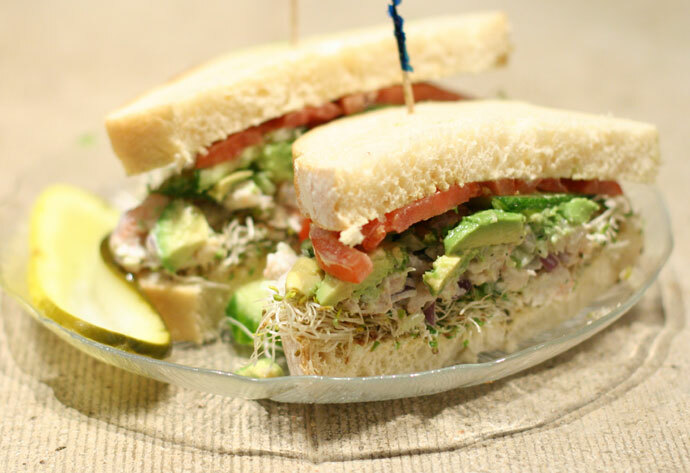 They make some of the best sandwiches in town, and I usually order the Shrimp Sandwich with Avocado ($7.50, also pictured below). Every month I look forward to eating the shrimp sandwich after an evening of performing music with the Sybaritic String Band. Calhoun’s has live jazz music on Tuesday and Sunday evenings, and Latin dancing on Thursday nights. Located near the University of British Columbia, Calhoun’s is a popular hangout and studying place for UBC students. They have Wifi internet access available. For another photo of the shrimp sandwich, please view Part 1. 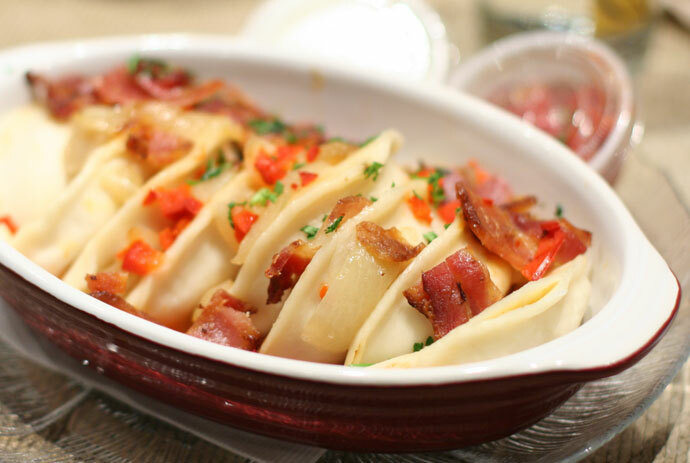 Perogies with bacon, sour cream and salsa ($7.00) from Calhoun's Bakery and Cafe in Vancouver, BC, Canada. Shrimp Sandwich ($8.00) from Calhoun's Bakery and Cafe in Vancouver BC Canada. Indian Oven (web site, map, reviews, 2006 West 4th Avenue Vancouver, BC, Canada, phone 604-730-5069) is one of my friend’s favorite places to go for Indian food in the Vancouver area. It’s located on the second floor of a building at West 4th and Maple Avenue in Kitsilano, with a great view of the bustling shopping district and the mountains and downtown skyline in the distance. The basic recipe consists of onions being chopped and then made into a sort of batter with chickpea or gram flour, spices, and sometimes with herbs, then fried until golden. They have a mild taste and are not hot. For the main course, we tried the Bombay Aloo ($10.95, pictured below), a tasty dish of diced potatoes cooked with cumin seed & specialty spices, and the Vegetable Korma ($10.95, also pictured below), which is made with carrots, cauliflowers, and broccoli cooked in the restaurant’s own special cream sauce. We also had an order of Pulao Rice ($3.50), and Garlic Naan bread ($2.25), which their menu describes as “white flour leavened bread coated with garlic”. Yum! Being from West Bengal, and growing up on Indian food most of my life I’m always looking for a taste of home. 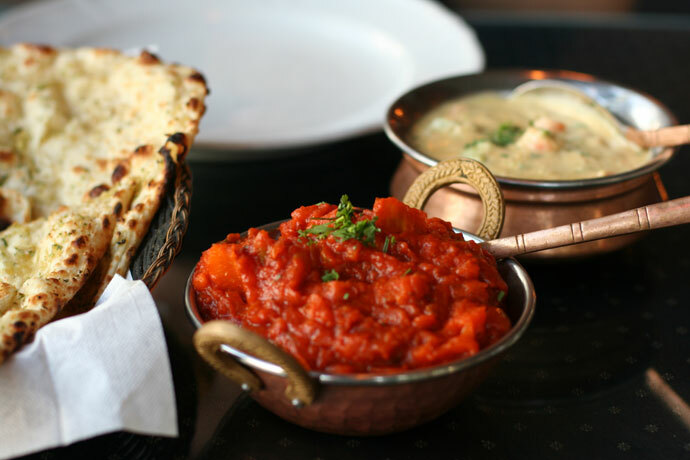 I discovered the Indian Oven last year and have found my self routinely selecting it for take out, over other Indian restaurants in Vancouver. 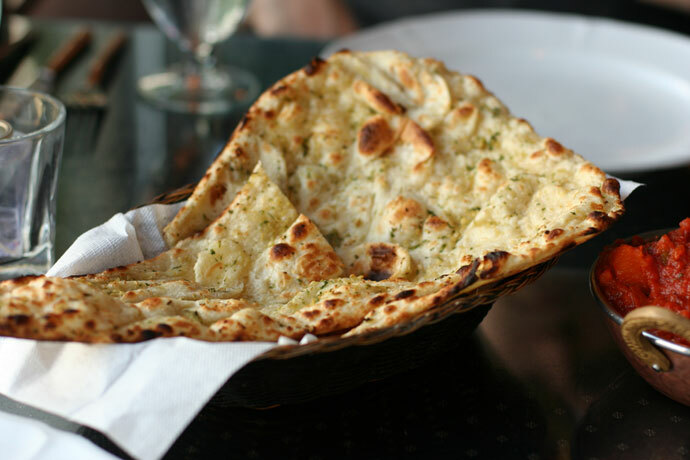 The Indian Oven specializes mostly in North Indian cuisine, which is quite common among Indian restaurants in North America… Tandoori/tikk/kebab specialties of this restaurant are far above most of the other restaurants in west part of Vancouver. The restaurant also has free delivery within a 5km radius (click here for their take out and delivery menu), and 10% off for pick-up orders. 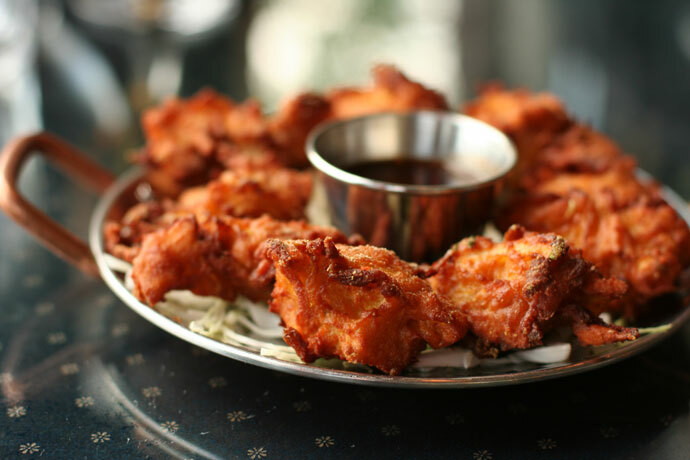 Onion Bhajis ($6.99, appetizer from Indian Oven restaurant in Vancouver). 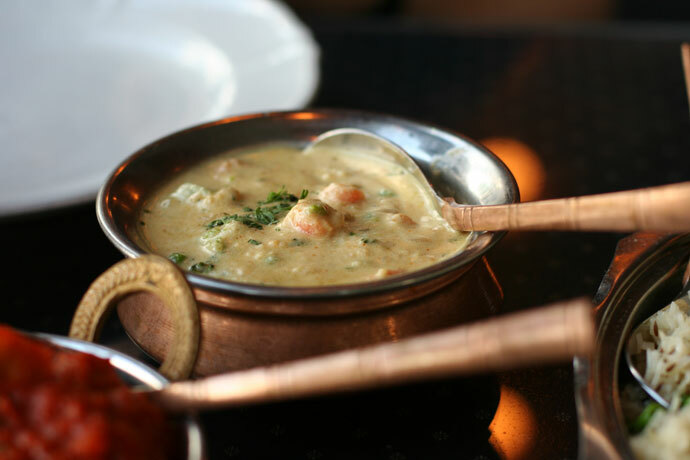 Closeup of Vegetable Korma ($10.95) from Indian Oven restaurant in Vancouver. View More Restaurants in the Catering category. We hope you enjoy the great Catering restaurants on Dine Out Here Vancouver.